Once I see by the customers pictures and sketches and feel pretty good about building their jaws. I need to correct the miss alignment in the jaw faces by adjusting the angle on the sine vise and re dressing the angle on the wheel to finish grind the jaws. 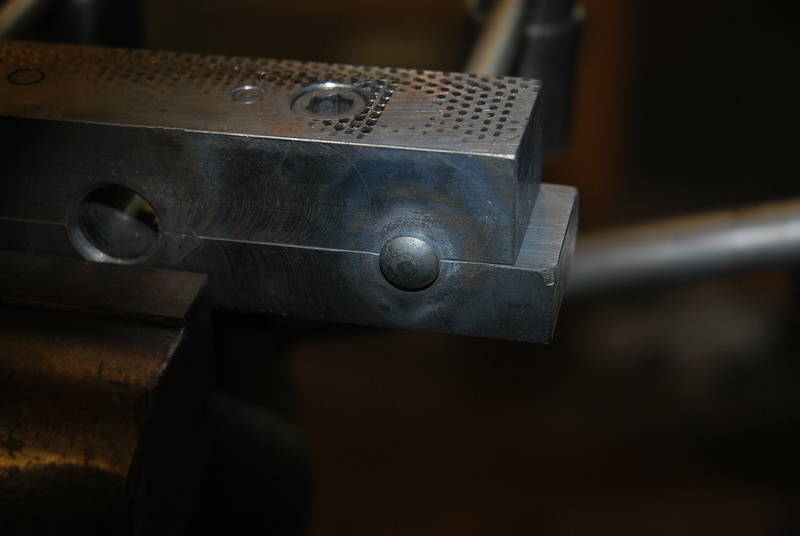 One angle must be dressed on the bottom of the grinding wheel and the angle on the back side is set by the sine vise. 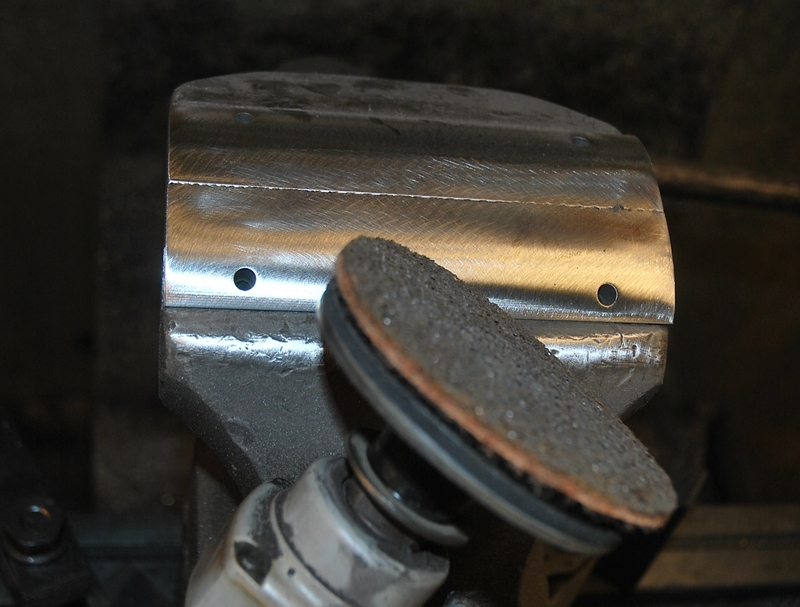 I relieve the wheel for side wheel grinding to finish both angles. Wheel ready to finish sizing the jaws. 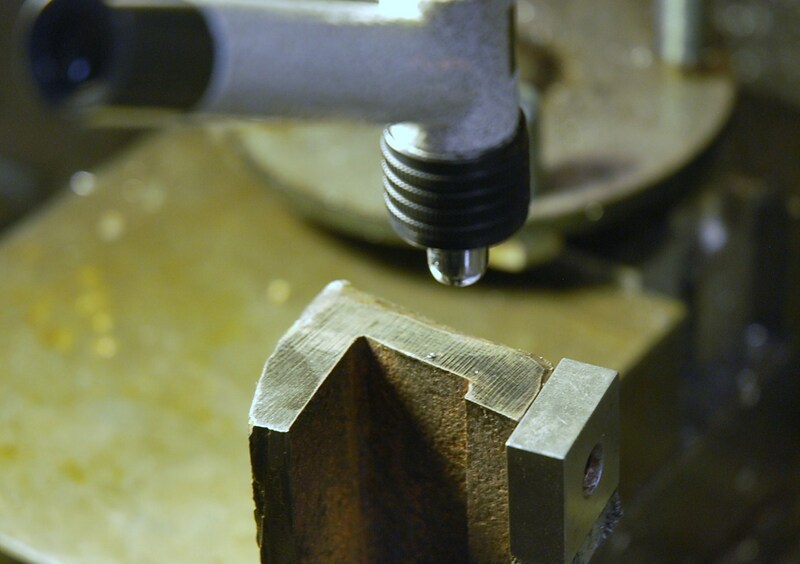 Using a ball end mill and stepping over to cut the top radius. Next is cutting the top radius. 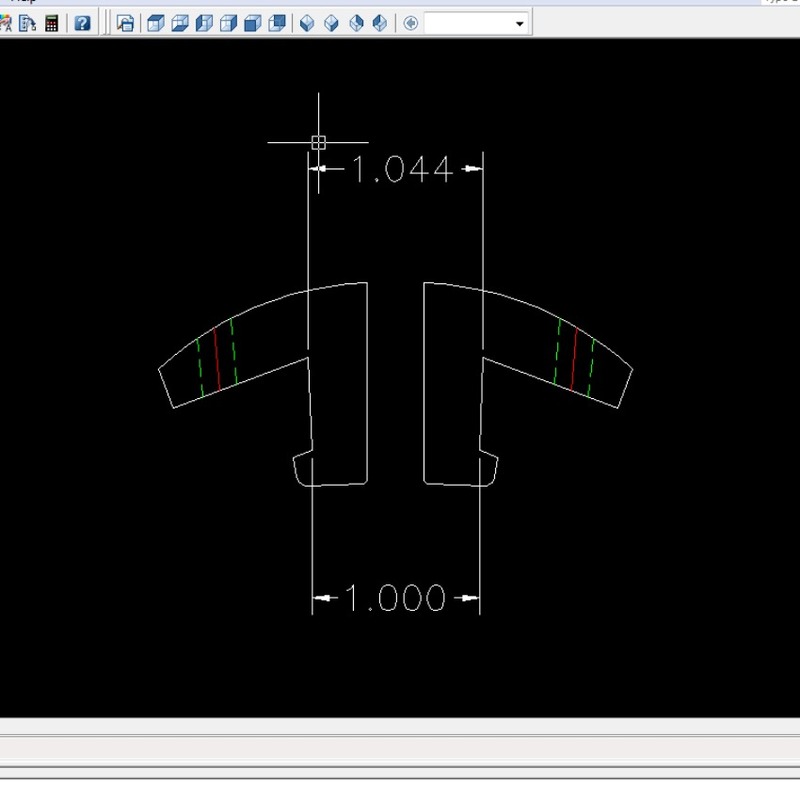 I create a surface model of the top arc in my software so my Cutting software will follow the surface. It cuts the arc by stepping over .05 and down .025 for roughing and a step over of .007 for the finish cut. The small step over along with a large ball end mill like a 3/8 diameter gives you a small peak to peak point that is easy to smooth down. Finish cut of .007 step over leaves small peaks to smooth out. Next is adding the pin holes, if possible do it on a milling machine, even using a good drill press if the vise is a small one. Or using a hand drill also works. I drill and ream the hole for my customers and this allows the customer to use the same drill size to spot the center of the hole, then drill 1/64 under the finished hole size before using a reamer to finish the hole. Picking up the C/L of the jaws before reaming the pin holes on a sine plate. 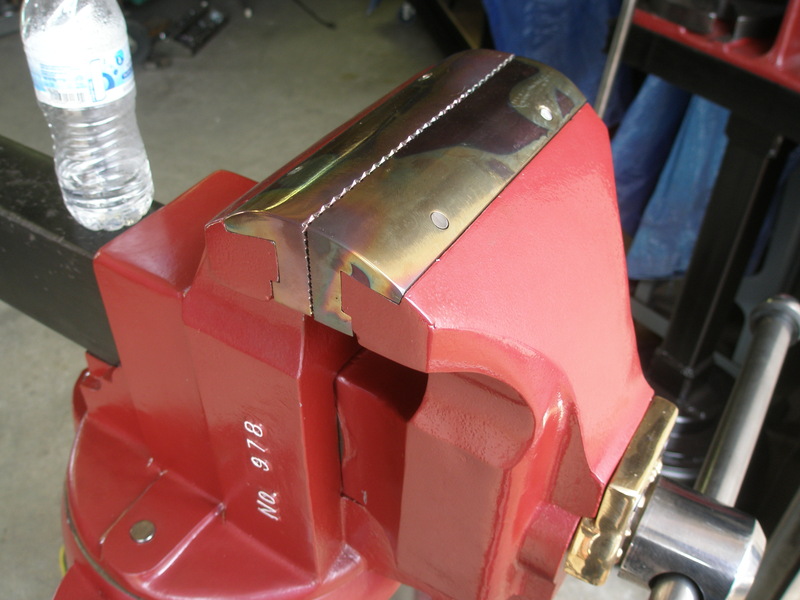 I have a Bridgeport 12 inch sine plate that I used for my #956 (6″ jaws) vise. The angle came out to 6 degrees so I could drive the 5/16 pins out from the bottom. It takes longer to get set up then it is to drill and ream the holes. I also include soft pins that are knurled at one end to provide a good press fit and making sure the pins do not work loose. I use a Scotch Brite pad for finishing. Now you are ready for cleaning up the radius cut and smoothing out the rest of the jaws, I mark the jaws underneath for assembling after heat treating. Now the jaws are ready for Heat Treating. 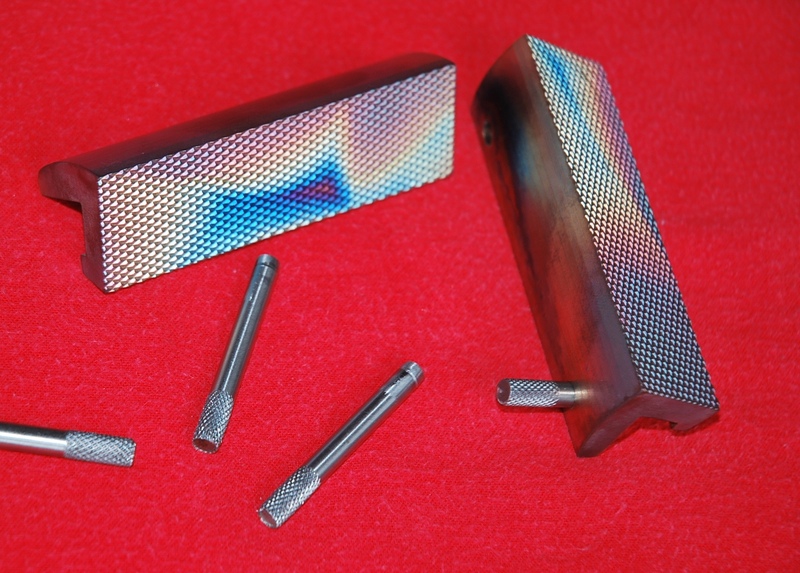 After heat treating and with knurled pins. They come back at 54 to 56 Rockwell hard. A lot harder then the original jaws from Chas Parker. A hand file cuts the original jaws and just slides over the new set. 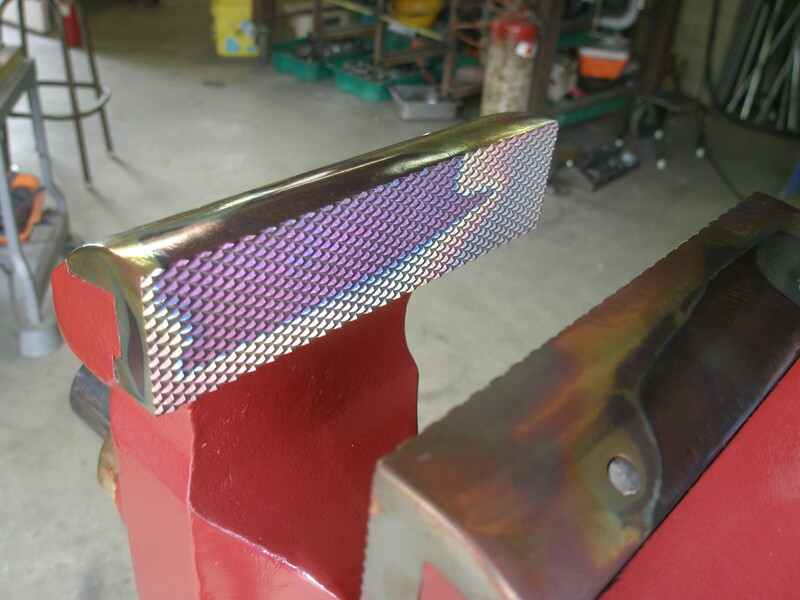 Back from heat treating your choice is to mount them to your finished restored vise or do more hand polishing to remove the colorful design you get from heat treating. 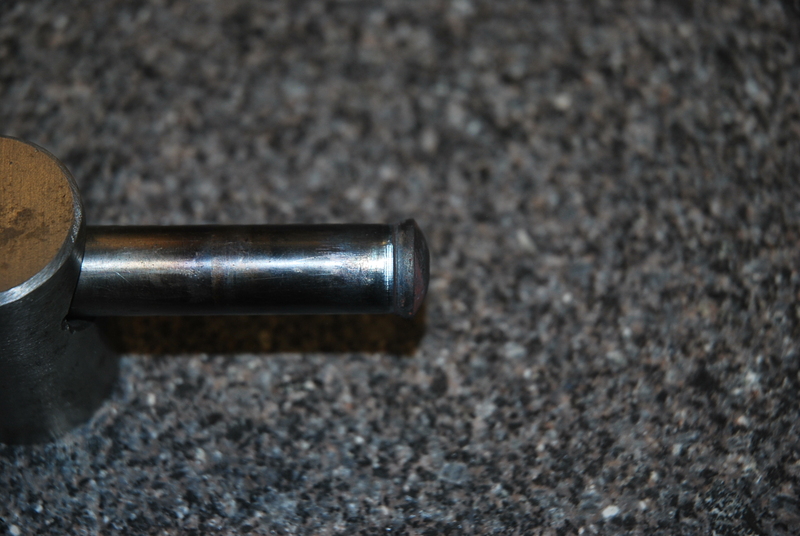 Final assembly by driving the knurled pins in. A very nice finished Chas Parker # 978 vise. Here is a finished # 978 Parker from Chuck in Tucson. These jaws are 8″ wide. 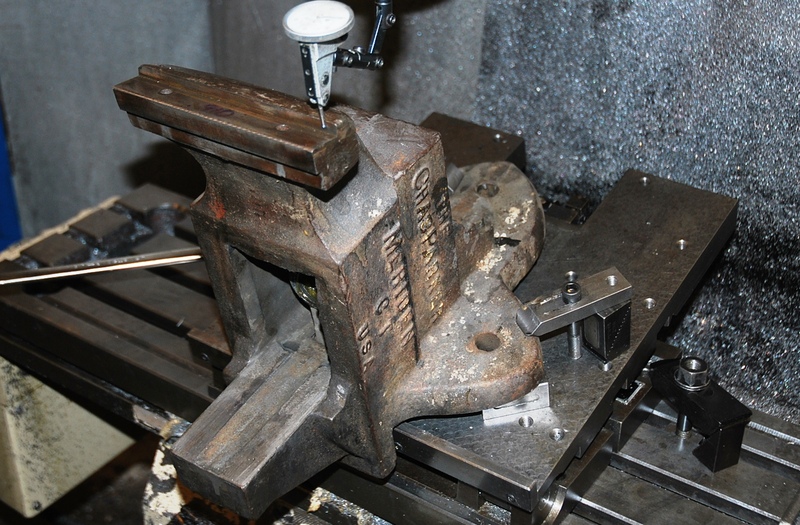 Really nice job of restoring this old Chas Parker vise. Yes these jaws are expensive to build, but having one of these old Parker vises with ruined jaws makes the vise below par. The old USA iron should if possible be brought back to working condition. 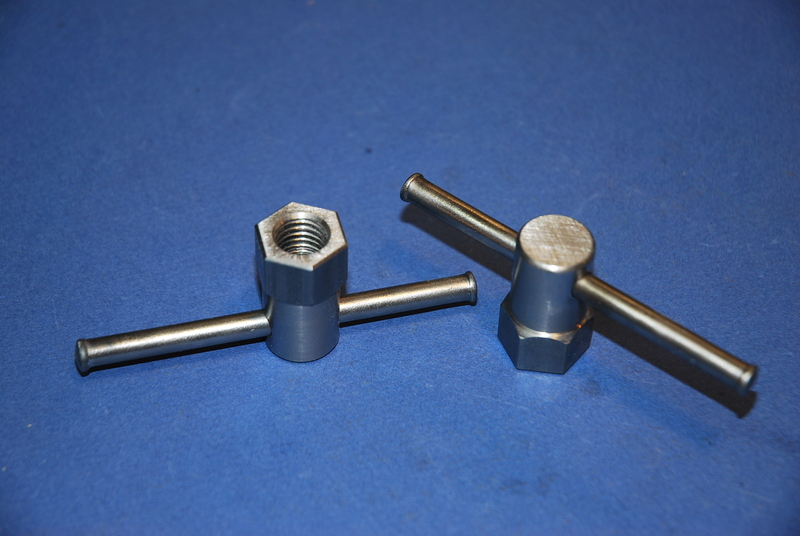 If you are interested in having a set of Chas Parker jaws built then please visit my site Here. Posted in Chas Parker Jaws. Just wrapped up building 96 pairs of Wilton, Rock Island, and Reed 3C jaws. 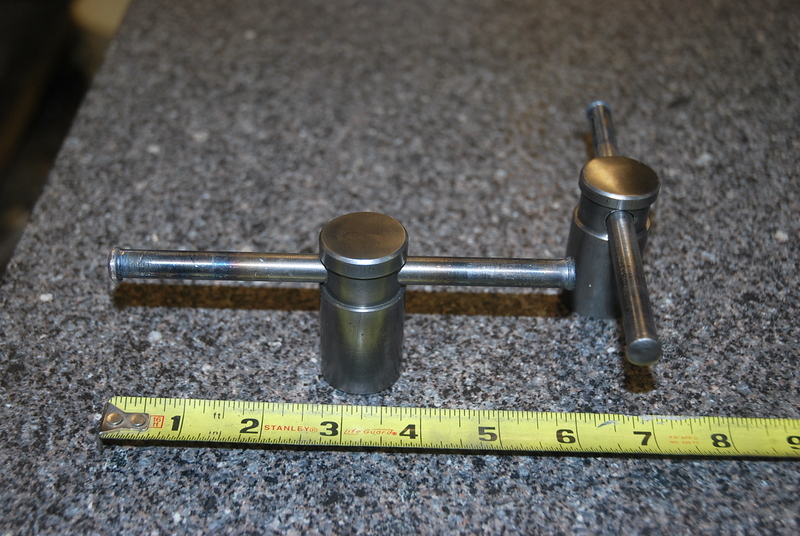 I am already low on 14 other pairs, but I wanted to fit a set of Parker jaws to my 956 vise. What I learned in this round of fitting is that the Parker company really did not have a sure fire setup for building these jaws. 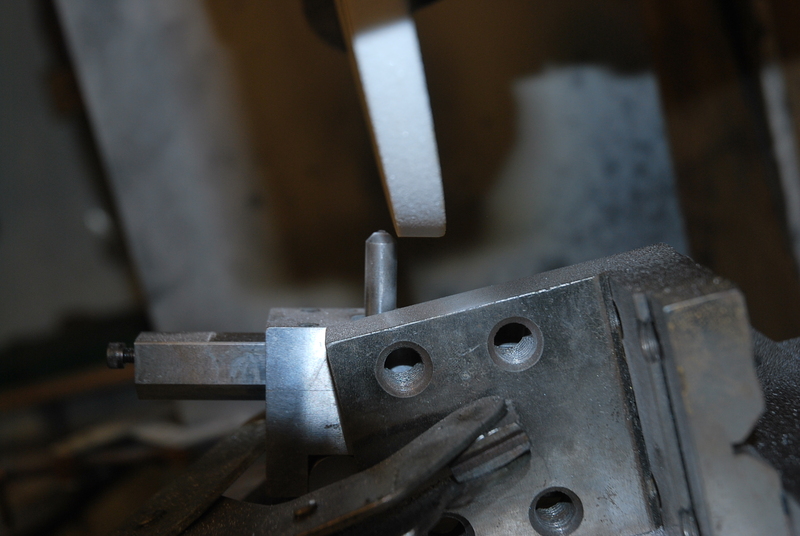 Each vise is stamped with a number on both the Static and Dynamic jaws supports. Then each jaw has the same stamped number, so during heat treating the fitted jaws should end up back where they belong. 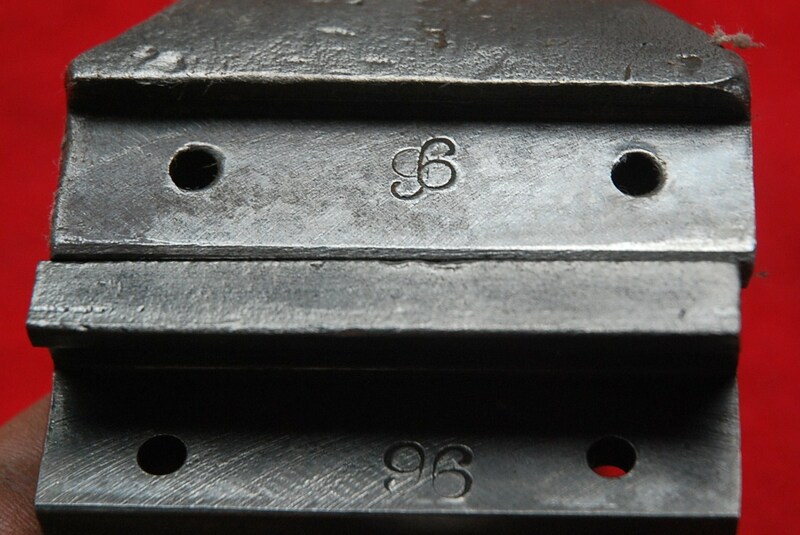 The 3″ jaws shown have the number 96 stamped very closely to each other. The other set is stamped the same number 96 but with a large gap between the 9 and 6. Clearly the assembler would know where the jaws belong. Another issue I found is that the face of the static and dynamic jaws are not parallel. This is why you see some Parker jaws with the faces hand serrated by a file. They filed the serrations because the jaw faces were resurfaced smooth for custom alignment and then the serrations were hand filed. 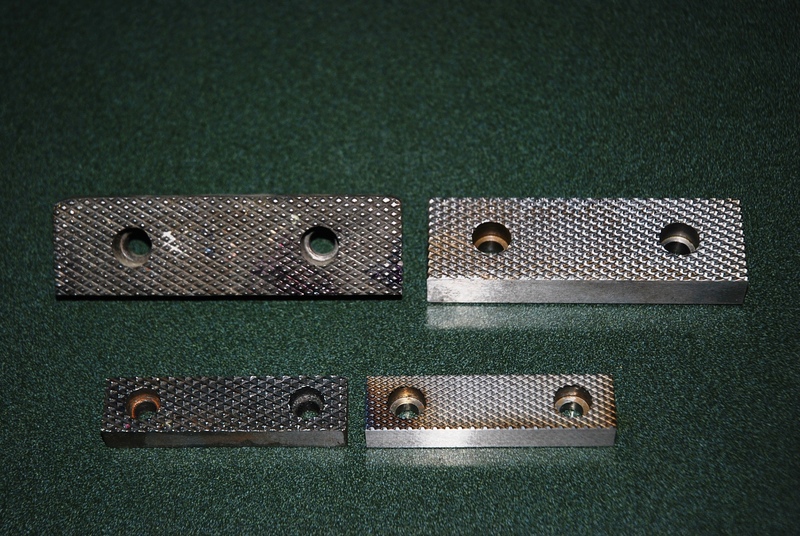 The set of 4″ jaws I measured shows a .044 difference that has to be made up on the jaw faces, I believe this adjustment was made in the final fitting. I cut the serrations on the jaw blocks when they are square, and I feel confident Parker did too on some of their jaws. Parker used a shaper, while I used a CNC with a double angled cutter. This is why I have to custom fit each jaw to each Parker vise. Next, I fit the jaws with my surface grinder. I dress an angle on the face of my wheel. The 6″ jaws take a 12.96 degree angle. Then I set the jaws in a Wilton 7″ sine vise and set it to 12.96 degrees. The wheel is relieved on the back side so I can use the back of the wheel to grind the jaw flat and square. Finish grinding in the two angles. I found all of these numbers with the microscope and setting points on my cad program. Then, after I got close to the width of the slot, I started slowing down for the final fits. Here is where I found trouble. The jaw inserts I used for gathering my numbers and creating the points only got me close. When I was at a point to check the squareness of the serrated faces I found my angles were off. And not by a little either. I was off by .09. This means I have to redress a new angle on the wheel and reset the sine vise, but at least I will know my final correct angles. The rest is easy, and by taking my time, making sure the static and dynamic jaws supports are filed and stoned flat, the finishing fit is just minutes away. Next is cutting the top radius and pinning the jaws to the Static and Dynamic jaw supports. I will cover this in the last blog on these Parker Jaws. I’ve been building jaws for some time now, and have been asked to build a couple pairs of Chas Parker jaws by various people. Well, it took me a year before I decided to try my luck. I was sent two different 8″ jaws from two different 978 Parker vises. 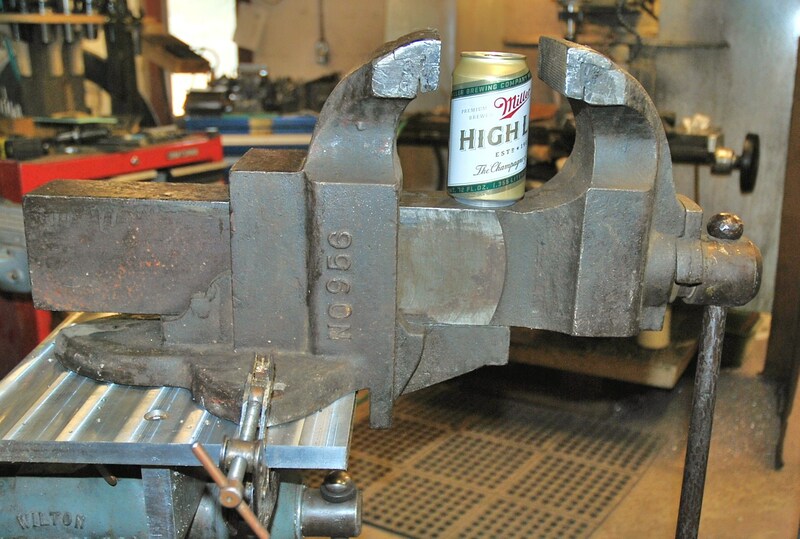 I own the Parker 956 (6″ jaws) vise, and my neighbor has a 973 (3″ jaws) in excellent shape. Then another customer sent me a 4-3/4 set to reproduce. So, I had three to fit, and one extra size to build. Hopefully I could do this. Being a retired Mold Maker, I knew they were not impossible to make, but selling them would probably be the hard part because they wouldn’t be cheap. Building these particular jaws would be very time consuming and require many setups. 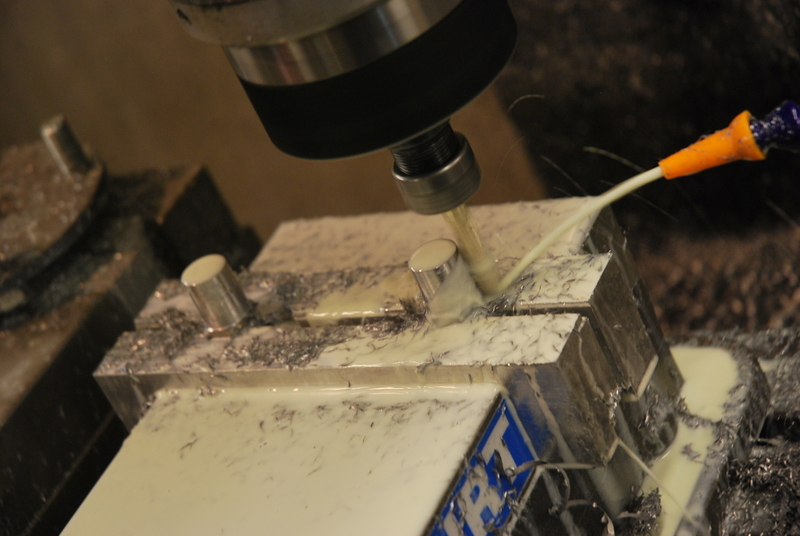 I don’t own a Wire EDM, a Horizontal Milling machine (which was used to build them) or a 4th axis VMC machine. I do have a CNC and a surface grinder. My 3-d software that I used building Injection Molds would also be a big help. Chas Parker 956 6″ jaws. 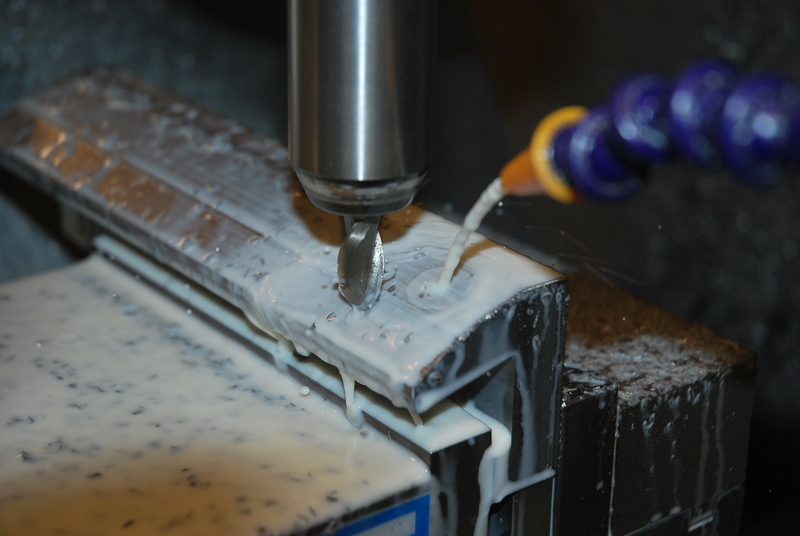 Measuring 8″ Parker jaws on a CNC with a microscope. 8″ Chas Parker’s serration cutting. First I had to figure out the geometry. I used a microscope in my CNC and found points that I could create in my CAD program like a dot-to-dot puzzle. 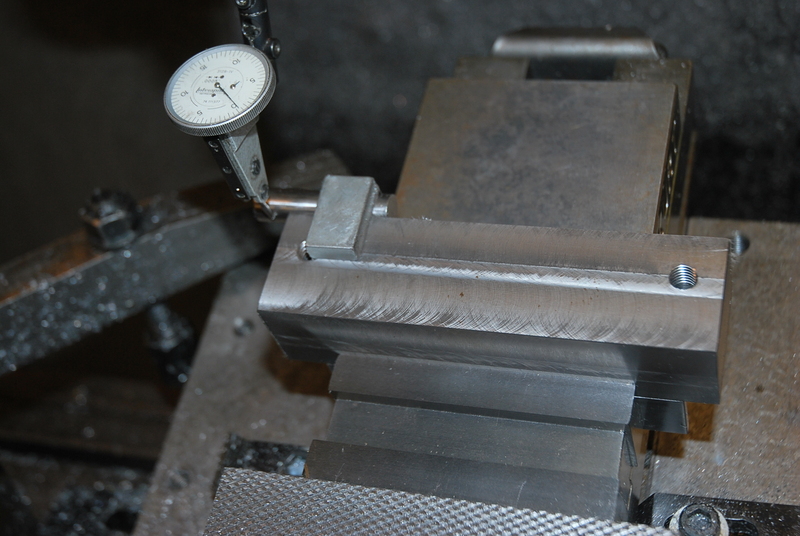 The A-2 tool steel I use is expensive, so I really didn’t want to make any mistakes. After I created the geometry, I double checked the angle on the surface plate just to be sure. 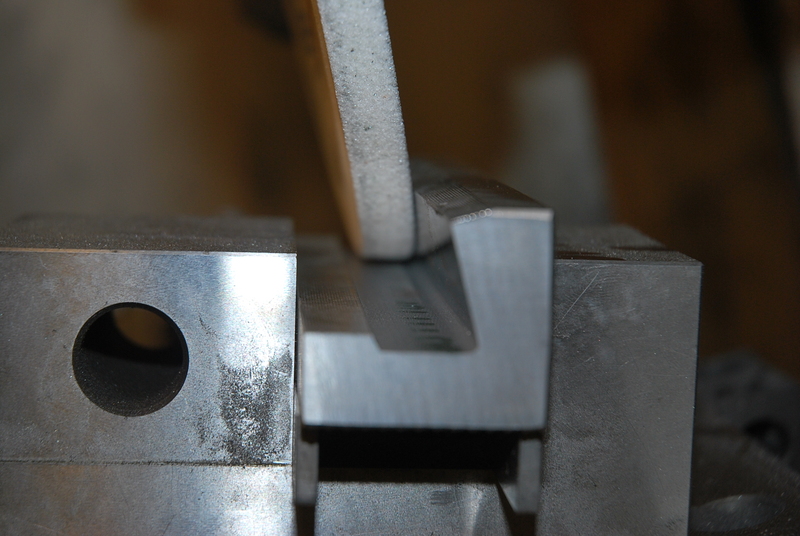 The top and face angle on the vise must be nails on or the jaw faces will not meet flush when you close the vise. I was trying to figure out why Chas Parker used this design, and the only answer I came up with had to do with the jaw support. 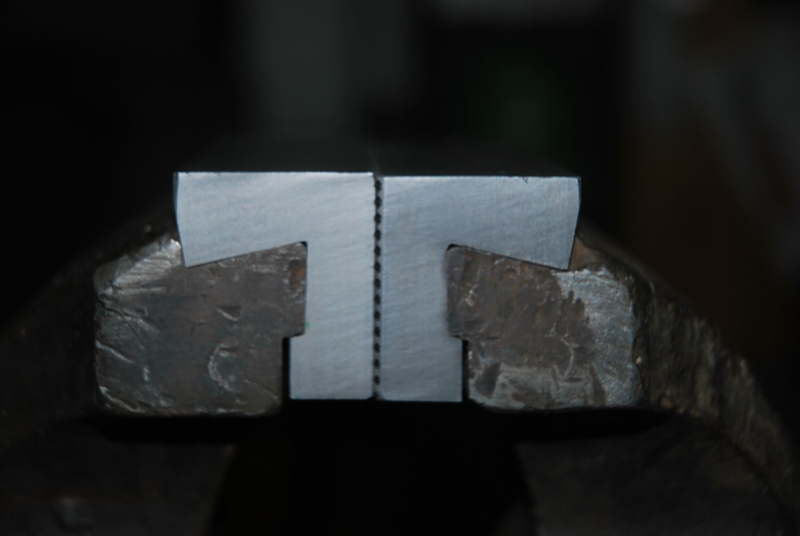 If a hammer blow was missed, the Static and Dynamic jaw supports would not break like you sometimes see on simpler jaw designs found in Wilton’s. My evaluation was that all four jaws were built with different angle. This creates more work, so instead of creating this angle on a Staggered Tooth type cutter, I would have to create the angle on my surface grinder wheel instead. I didn’t want to make different angled cutters and have to re-sharpen them to the right angle. 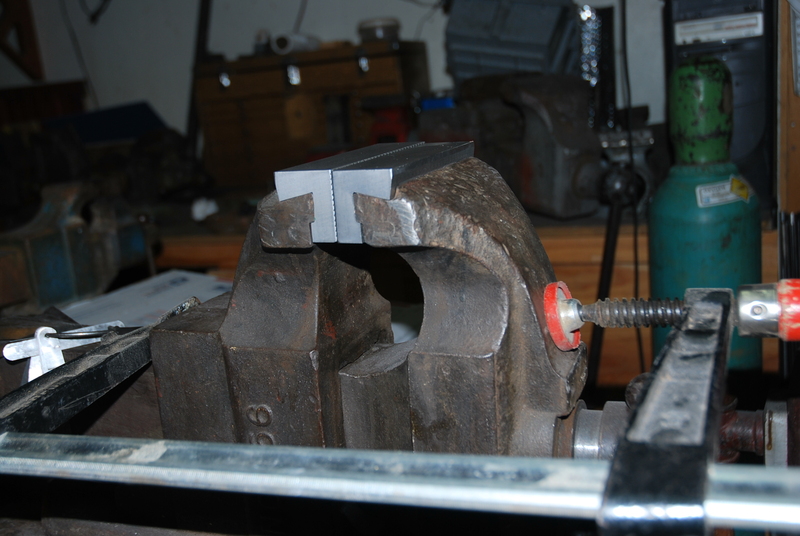 It was easier to dress the correct angle on the grinding wheel, but first the jaws had to be roughed out before going to the surface grinder. 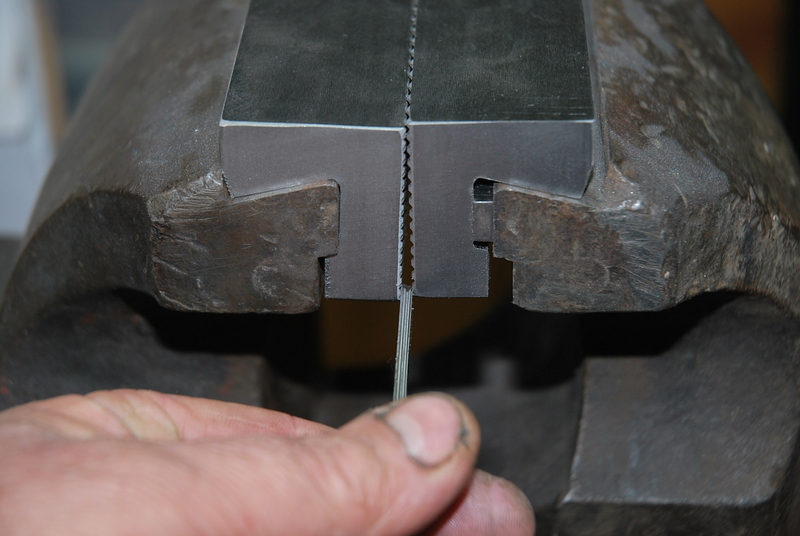 Sweeping in a gage pin to find the edge of the Parker jaws on the sine plate. 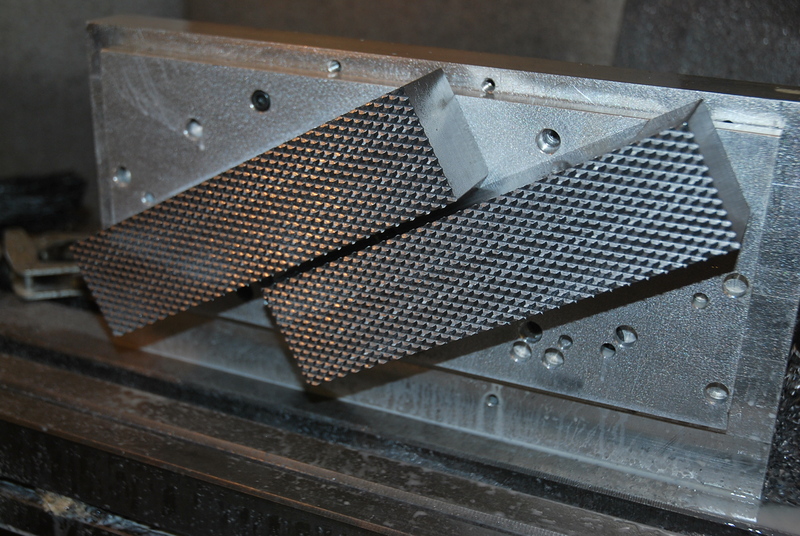 After I cut the serrations, I set the blocks up in a vise bolted to a large sine plate made for heavy cutting on a CNC or a Bridgeport type machine. The jaw block had to be located precisely on the correct angle; the 8″ was set at 12.54 degrees and the others were up to 18 degrees like the 3″ set. I used the CAD program to calculate location but it could also be done with trig. I also set the tools to the top of the pin because I found this was the easiest for setting all my cutters. Scallop cutting with a 3/8 ball end mill. 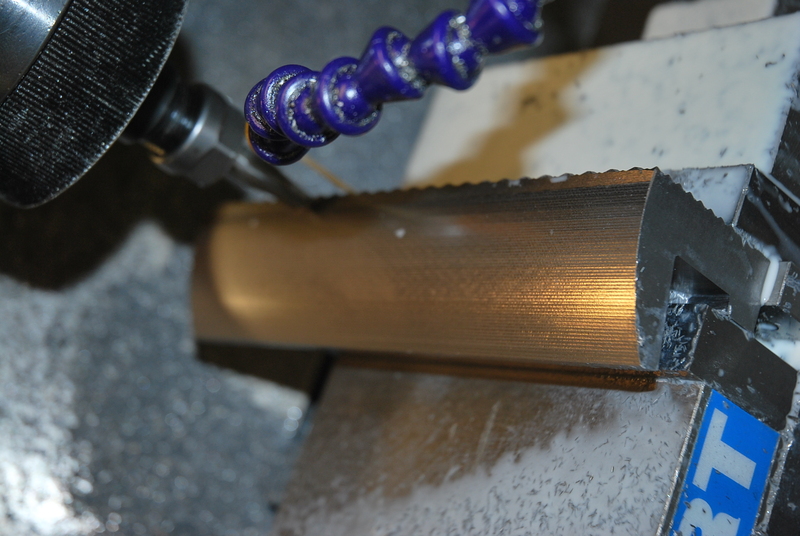 After roughing out most of the material, I programed cutting a finishing cut with a ball end mill. I did a step over with 3 dimensional cutting of .015 per scallop. It took time to cut that way, but it was the simplest way I could do it with the machines I have. I’m excited to write about finishing and fitting the incredible Chas Parker jaws, but I have to end this blog until I can get caught up on my Wilton orders. So stay tuned. You’ll be able to find them on my other site benchvisejaws.com as soon as they’re ready. A tool is only as good as the material it is made from. 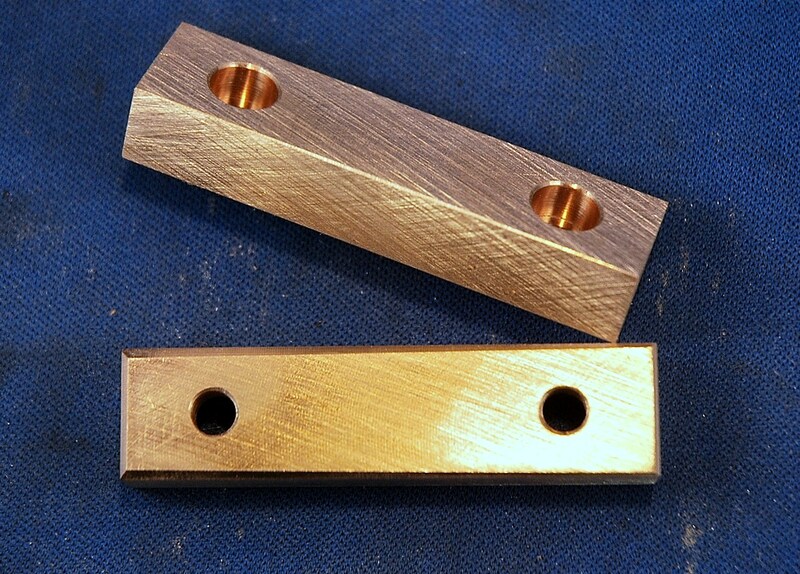 Vise jaws can be made out of just about anything from brass or aluminum to copper or soft steel. 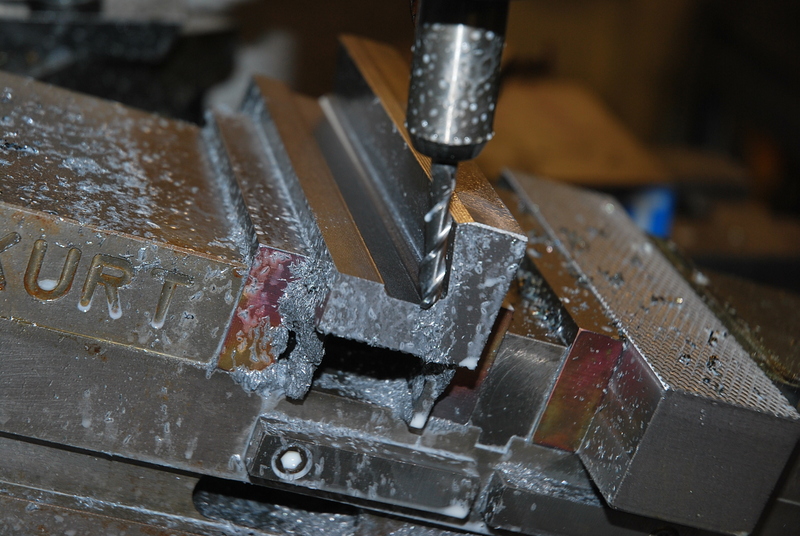 The best material for vise jaws is Tool Steel. 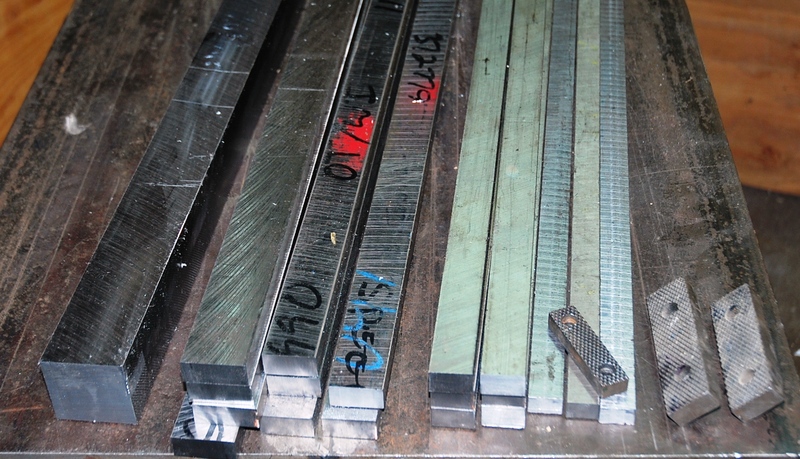 There are several options for what kind of Tool Steel to use. I am an Old Timer. Based on my personal experience, I would choose S-7 or A-2. I believe S-7 is the best choice for Bench Jaws, but I use A-2. That’s because it’s easier to find and buy, and it comes in a wider selection of sizes in bar form. The most important reason I choose A-2 is because it is more stable after Heat Treating. 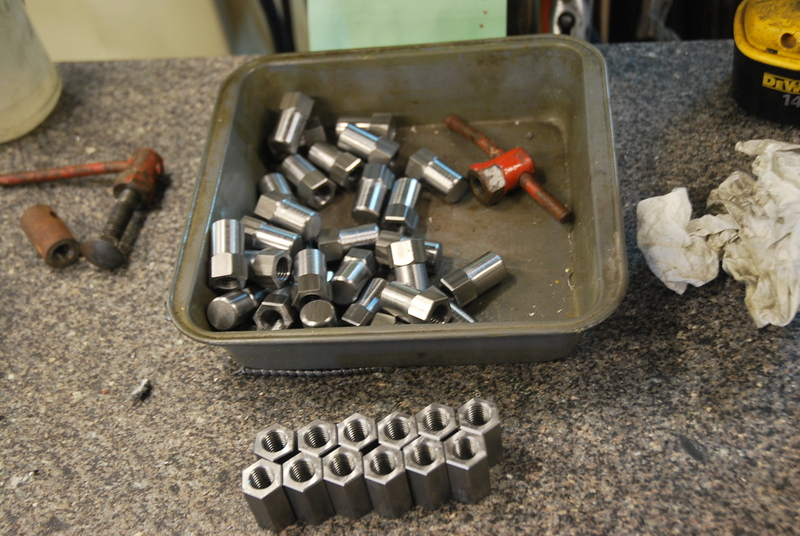 Out of the oven, most Tool Steels are over 60 Rockwell, which is way too hard and brittle to use. After the steel is cooled then it must be placed back in an annealing oven and re-heated to a certain temperature. For instance, S-7 to 500 degrees and A-2 to 1000 degrees, will take them both down to a tough but less brittle 54-56 R/C. This means when I weld, or use my torch flame close to A-2 jaws, I don’t worry about changing its hardness. The original Wilton jaws built in the early 40’s to late 60’s were very hard. You can find some of these old Bullet Vises around with still sharp serrations even though they are over 50 years old. See the photo below with two old jaws from the 50’s and the new ones made by WiltonViseParts. The old ones can still can be used. Old jaws next to new jaws. My Heat Treater and I tested several old jaw sets for their hardness and found they were a consistent 54-56 Rockwell Hardness. He believed they were made from an Oil Hardening Tool steel like O-1 which is an oil quench. That was a popular Tool Steel used at that time. A-2 and S-7 are both air cooled, and that is one reason they are so stable after heat treating. I have made jaws out of O-1, but found they warped more than I liked; about .007 over 5″. The A-2 shows no sign of warping, so that means the jaw face stays flat and will close parallel as it should. 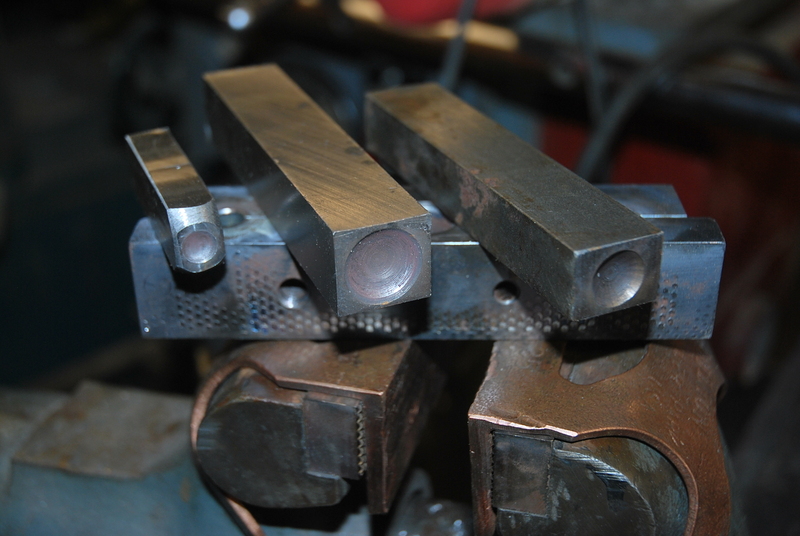 When annealing Tool Steel, you can induce an inert gas to keep the jaws from oxidizing. My Heat Treater likes to use nitrogen. 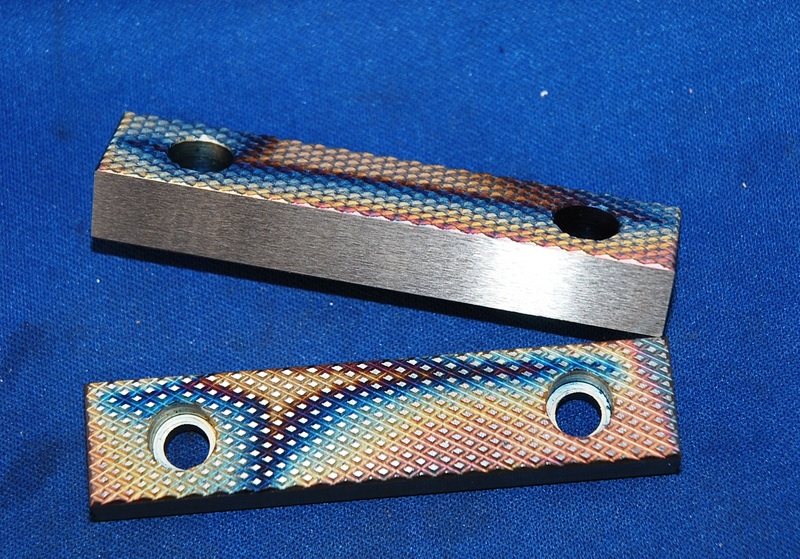 When nitrogen is used at 1000 degrees, and it adds a colorful pattern to the A-2 steel. Each jaw pattern is unique. See some examples in the picture below. 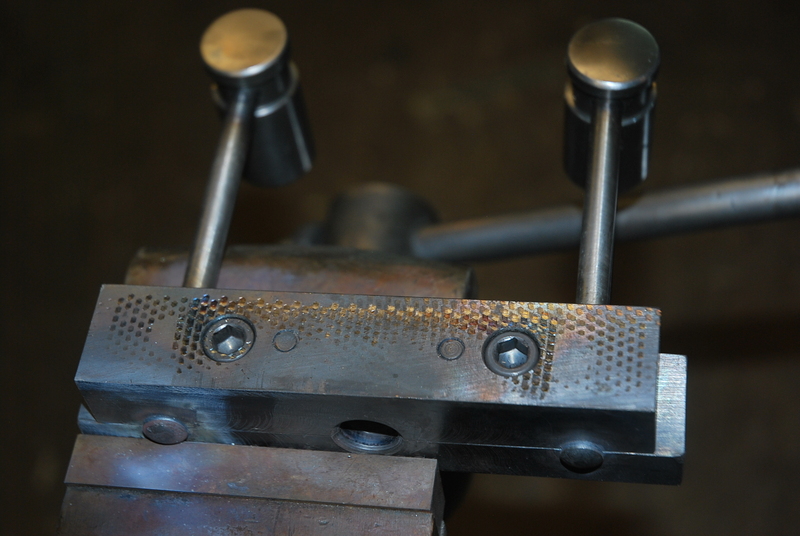 If the jaws are made from a good Tool Steel and heat treated to a proper hardness, then they should last the life of your vise. 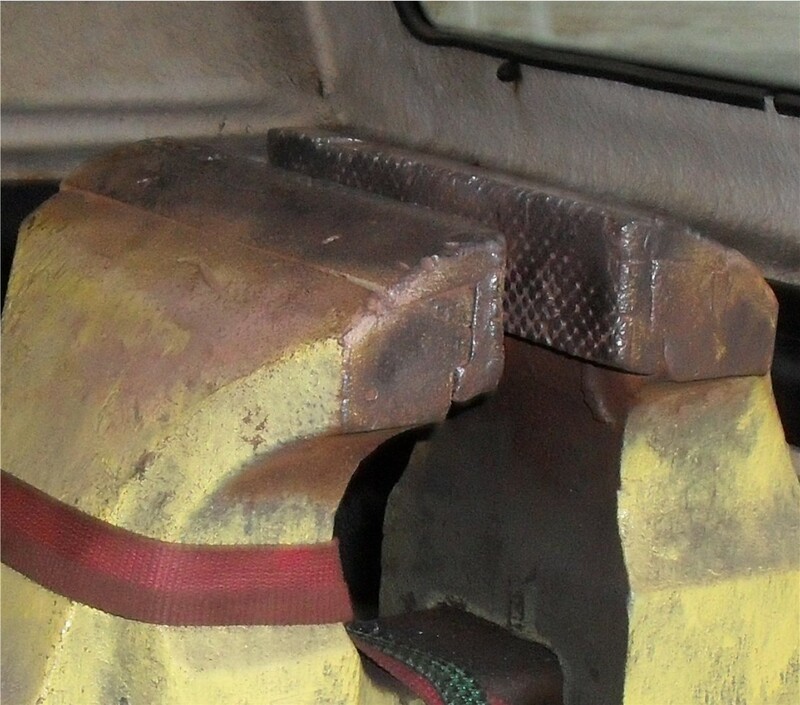 If you clamp a hard object like a car axle, or tighten down on a hard object like U-joints which are about the same hardness as your jaws, then the serrations will flatten or chip. Copper Caps not only protect the work piece, but also protect the jaw faces. One thing I tell my customers is that they are buying a Premium set of replacement jaws, and if cared for, they should never need to buy more.